Trusted with over 600 LCBO retail sampling events for the largest winery in the world. Our enhanced retail sampling activations for LA MARCA sold an average of 73 bottles of product, per retail sampling event. A terrific example of how we get more products in shopping carts. I guess that’s why our client scaled the retail sampling program across Canada. 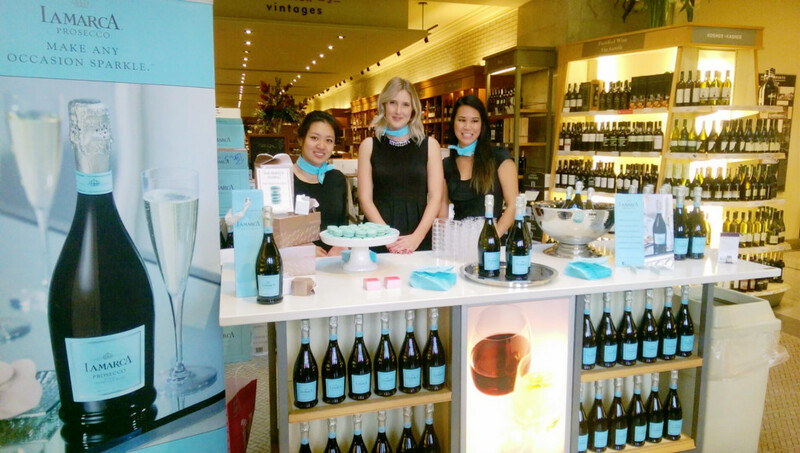 Here’s one example where highly trained brand ambassadors who were dressed to impress, with a custom LA MARCA neck scarf, inspired customers to taste a sample of LA MARCA, a refreshing NEW Prosecco available at the LCBO for a limited time only. Each sample was paired with a delicious, custom-flavoured macaron from Nadège Patisserie. Of course in the colourful LA MARCA blue, which was custom made for just for us. These almond meringue wonders are skillfully crafted to deliver a delicate crunch, followed closely by flowing layers of flavoured buttercream, ganache or jam in every bite. Whether you choose to enjoy as a perfect pairing with LA MARCA, you can’t go wrong with these colourfully delicious treats. The highly trained brand ambassadors ensured every customer received the most important product information, the complimentary gift bags and the perfect pairing helped motivate people to add a couple of bottles to their shopping carts. Now that’s delicious!